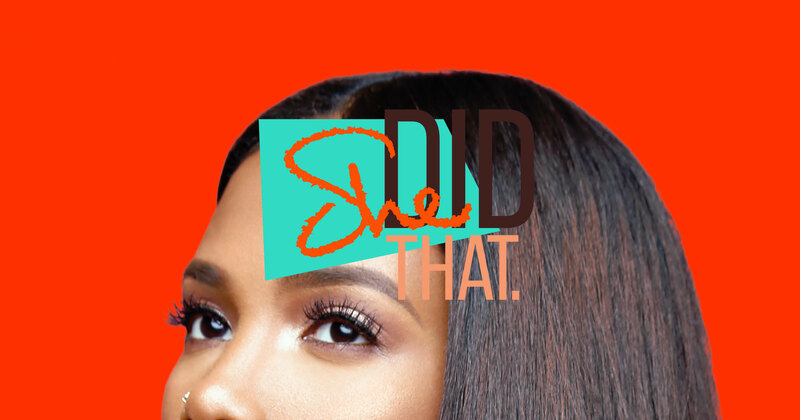 Renae Bluitt’s first cinematic project, 'She Did That.,' explores the passionate pursuits of Black women and their entrepreneurship journeys. 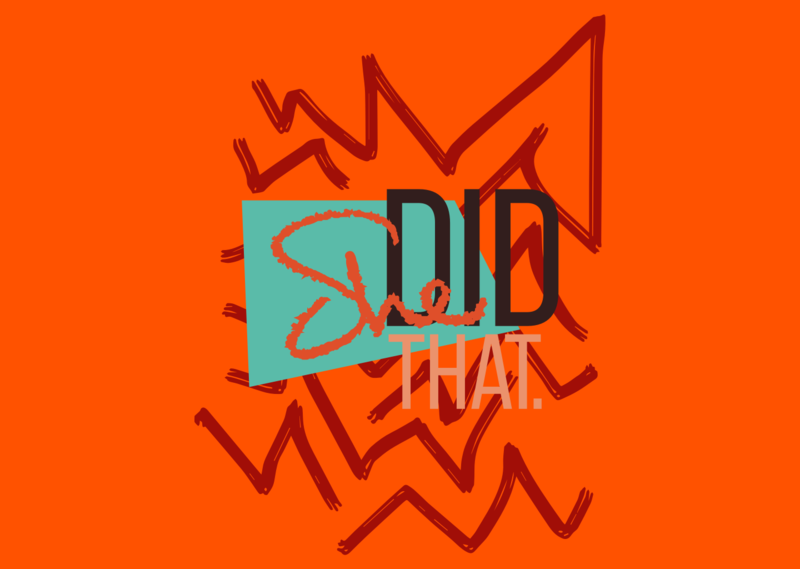 An extension of Renae's In Her Shoes blog, 'She Did That.' offers an intimate peek inside the lives of four Black women entrepreneurs who continuously raise the glass ceiling for future generations. There are approximately 1.9 million Black women-owned firms that employ over 376,500 staffers and generate $51.4 billion in total revenues. What drives Black women to turn their obstacles into opportunities and passions into profit? 'She Did That.' seeks to answer this question with the goal of inspiring the next generation of change agents. 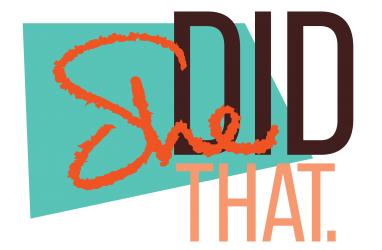 Spotlighting well-respected industry leaders through exclusive, never-seen-before footage, 'She Did That.' 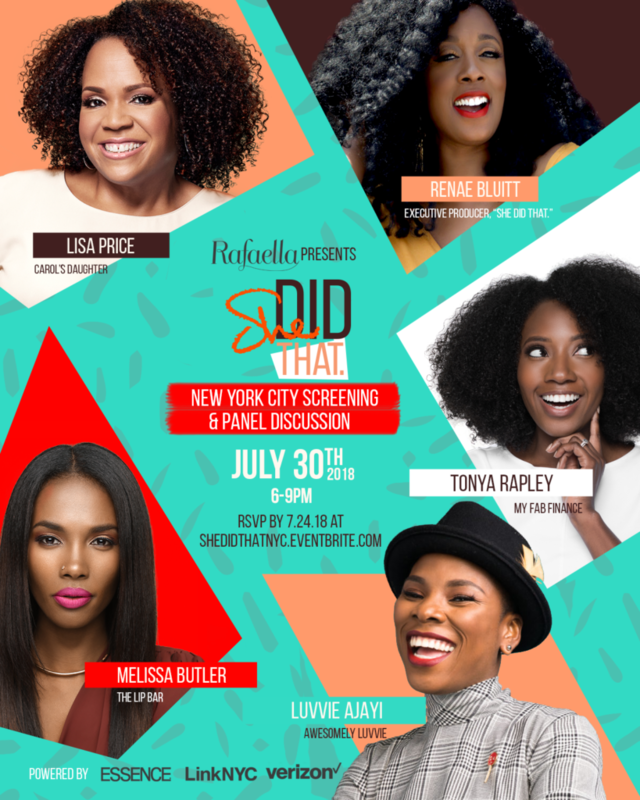 features vulnerable conversations with four fly female entrepreneurs - Luvvie Ajayi (New York Times best-selling author, speaker and digital strategist), Lisa Price (founder, Carol’s Daughter), Melissa Butler (founder, The Lip Bar) and Tonya Rapley (founder, My Fab Finance.) Their powerful testimonies as to how grit and perseverance set the stage for success reminds audiences that Black women are indeed bosses in business, embarking on their own ventures at six times the national average. 'She Did That.' is a timely and poignant documentary on Black women entrepreneurs who are building legacies and making history - a conversation that should not be missed. 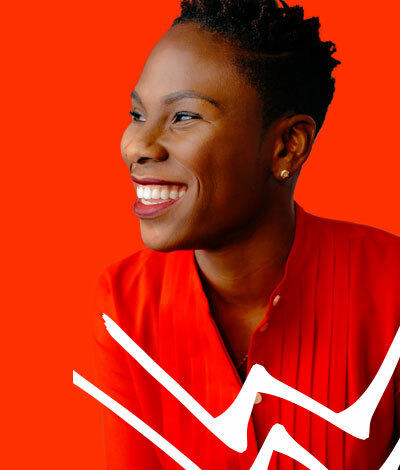 Luvvie Ajayi is a New York Times best-selling author, speaker and digital strategist who thrives at the intersection of comedy, technology and activism. 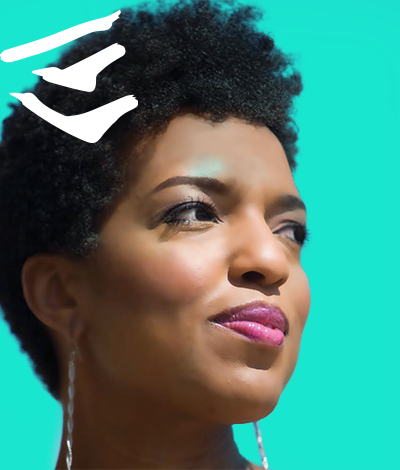 A fourteen-year blogging veteran, she is the voice behind Awesomely Luvvie, widely-respected humor blog that covers everything pop culture – from TV movies and technology to travel, race and life’s random adventures. Luvvie’s work as a culture critic and activist has brought her much acclaim. She was selected as a part of Oprah Winfrey’s inaugural Supersoul100 list in 2016, as someone who “elevates humanity.” She was voted as the Influencer of the Year at the 2016 Iris Awards and was chosen as a 2015 Black Innovator by XFINITY Comcast. She is also a past winner of the Women’s Media Center’s Social Media Award for using her voice and humor for pop culture critique and gender and racial justice. 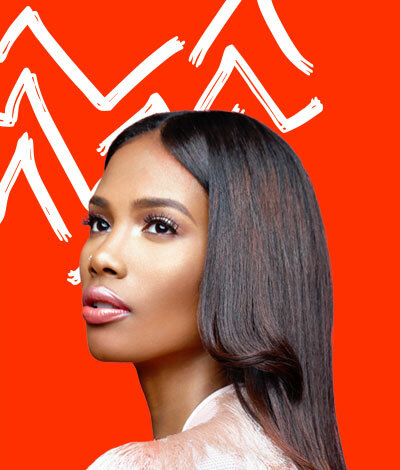 A sought-after speaker, host and correspondent, Luvvie leverages her background in marketing, communications and new media to present on topics related to blogging, branding, nonprofits, activism and humor. She has interviewed bosses like Oprah Winfrey, Geena Davis, Gloria Steinem and Shonda Rhimes. The alum of the University of Illinois has also spoken on several notable stages in the U.S. and around the world. She is the creator and Editor-in-Chief of Awesomely Techie, a resource site for writers, bloggers, entrepreneurs, small business owners and everyday people who want to use technology to make their work and personal lives more efficient. 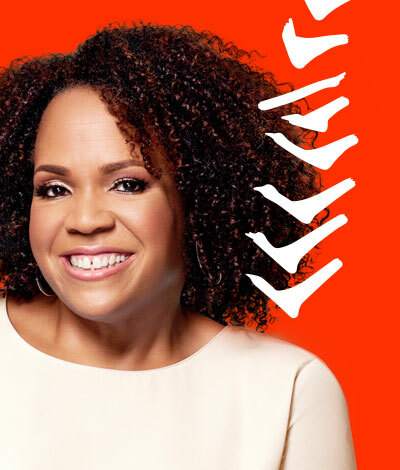 From humble beginnings in her Brooklyn kitchen, Founder of Carol’s Daughter, Inc., Lisa Price transformed her beloved hobby of mixing up fragrances and creams at home into a multi-million dollar beauty empire. In the early 1990s, Price began experimenting with making her own fragrances and perfume sprays when she wasn’t busy working in TV production. She added oils to unscented lotions, and began learning the aromatherapeutic and healing properties of the oils. In 1992, Price dedicated herself full time to creating beauty products. With $100 in cash, her own kitchen, and the simple notion that people should follow their hearts, Lisa started building the collection that would become a beauty revolution. In August of 1994, Price officially established Carol's Daughter (the company lovingly named after her mother). Initially starting out with a handful of steady customers, those numbers grew in leaps and bounds as women outside her neighborhood and circle of friends began to take notice. Almost overnight, celebrities like Jada Pinkett-Smith, Erykah Badu, Rosie Perez and Halle Berry became loyal customers. Today, Carol's Daughter sells millions of dollars’ worth of products, having launched an exclusive collection in Target stores nationwide and on Target.com in March 2014 as well as extending into select Walgreens in March 2015. As a culmination to the Carol’s Daughter business trajectory, Price sold her company to L’Oréal USA in November 2014. Price and her husband, Gordon, have two sons and a daughter and live in Brooklyn. When she can find the time (between managing her business and family), Price enjoys going to the beach, reading, crocheting, and watching movies. 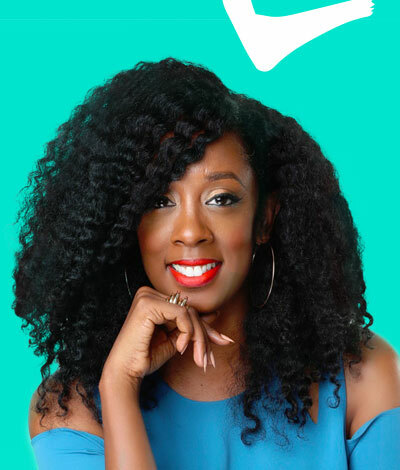 Melissa Butler is a Detroit native who has skillfully and strategically launched a start-up beauty brand, The Lip Bar, into a nationwide phenomena. And how did she do it? Intuition paired with the passion for results. Butler obtained her Bachelor’s Degree in Business Finance from Florida A & M University before going on to work on Wall Street as a licensed stock broker. 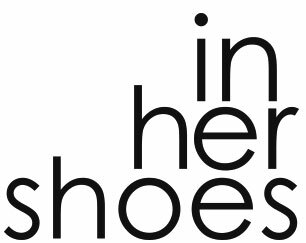 Conceptualized and launched in 2009 by Renae Bluitt, Founder of Crush Media, In Her Shoes was created to empower, enlighten and uplift women committed to realizing their dreams. As the one-stop shop for women committed to being the captain of their own ship, In Her Shoes shines light on ladies leaving their mark on the world and paving the path for generations to come. The cornerstone of the In Her Shoes blog is the Fly Female Entrepreneur Interview Series, where, as the name of the blog implies, readers are provided an all-access, behind-the-scenes entrée to "walk in the shoes" of an accomplished female business owner and gain insight into what her day-to-day entrepreneurial journey is really like. These unguarded, personalized accounts offer invaluable wisdom and inspiration - the core of what In Her Shoes embodies. 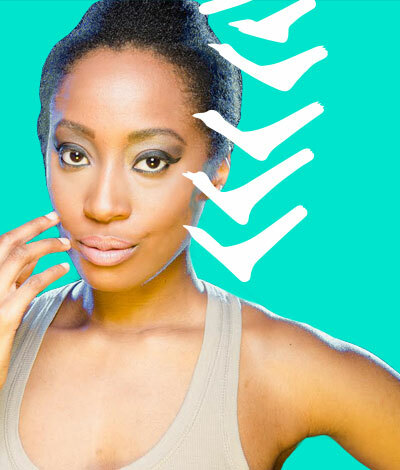 Ayana Barber is a New York City based freelance producer and writer. She has worked with major networks ranging from Viacom to Netflix. Some of her notable projects have been Louis C.K's independent project Horace & Pete, Netflix's Jen Kirkman: Just Keep Livin'? and Animal Planet's Monster's Inside Me. Trizonna McClendon hails from the South Side of Chicago. She is an Emmy award-winning television producer who has lent her talents to networks such as NBC, Bravo, BET, HGTV, Lifetime and many more. Some of her credits include; Real Housewives of Atlanta, HGTV’s Design Star, I Want To Work For Diddy, Kimora: Life In The Fab Lane, and most notably the Emmy award-winning, Steve Harvey daytime talk show. 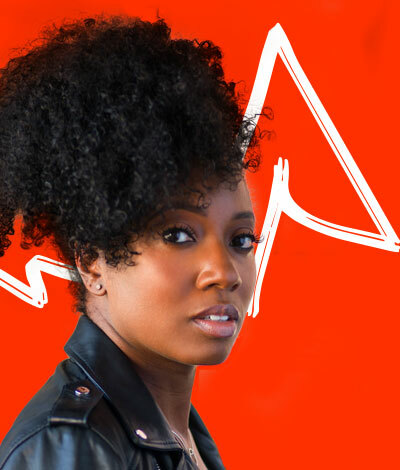 As a multi-passionate creative, Trizonna also flexes her vocal prowess as a singer/songwriter with music that can be heard on the reboot of Spike Lee's She's Gotta Have It for Netflix. 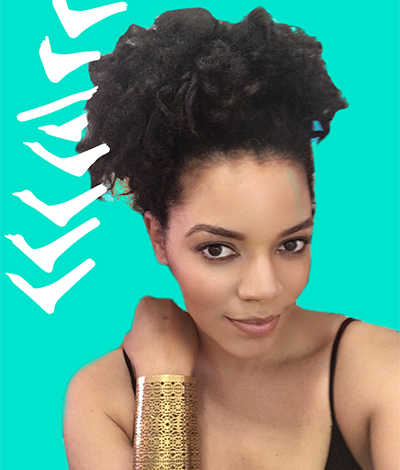 Brittany M. Stalworth is a New York City-based TV and Film Producer. Hailing from Philadelphia, Brittany set her sights on NYC in 2012 after graduating from Hampton University. She landed her first job at MTV and has since worked with a variety of networks including Bravo, Food Network, and OWN. Her most recent projects include Bravo’s number one show, The Real Housewives of Atlanta and ‘Released,’ an OWN Network docu-series that highlights the trials and tribulations of re-entering society post-incarceration. 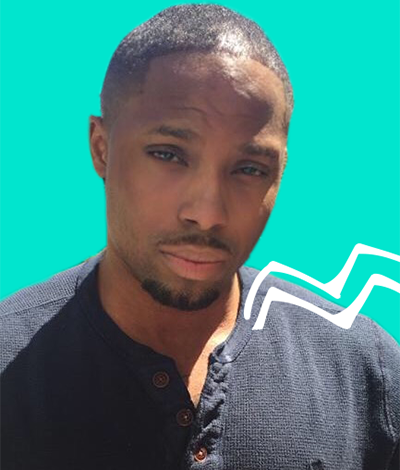 Darnell Stalworth is a TV & Film Editor and a Motion Graphics Designer based out of New York. Born and raised in Long Island, Darnell spent his summers as a youth shooting and editing videos of skits he and his friends created. This summertime hobby soon turned into a passion that landed him a job at HBO after college. He has since worked with some of the top industry networks including MTV, VICE, and Netflix. His most recent projects include Netflix’s hot topic series Explained and VICE’s HBO special A World In Disarray, which explores America’s foreign political role in the current climate of the world. 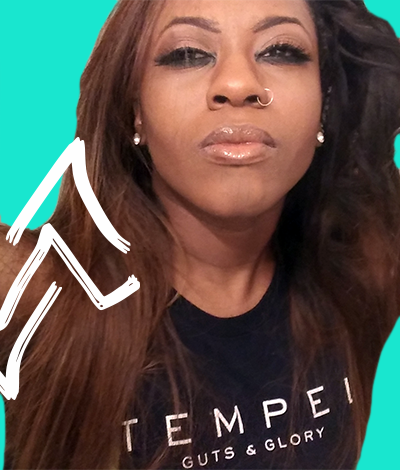 Ashley is the Baton Rouge bred, Atlanta based co-founder of brand incubator Patent Ventures and fitness brand Tempel. Teaching herself to code and design at the age of 12, she went on to earn a BFA with a communication distinction, additionally studying the relationship of culture and commerce. Including time as a freelancer, LSU's web designer, and post layoff entrepreneurial journey, she has practiced creative direction and brand architecture for over 12 years. Ashley has executed strategy and multidisciplinary design for In Her Shoes Blog, EDEN BodyWorks, Claire Sulmers & Fashion Bomb Daily, Aamanns-Copenhagen Tribeca, Mischo Beauty, EXI Concepts and many more. Once a fitness bikini competitor, she is now a weightlift lover and is also a hip-hop aficionado, Kobe Bryant fan, and spiritual gangster. The film would like to extend special recognition to Carol’s Daughter, The Lip Bar, My Fab Finance, and Awesomely Luvvie. © 2019 She Did That Film.